Time to step up your branding and design game? But don’t want to invest in a full custom project? Our Pro-Agent Real Estate Website is the perfect choice for you! You get all the full features and technology of our Premium Agent Website , and more. Talk with one of our representatives and come up with your vision for the customization of your new website. Want new legal photos with standard copyrights? You got it. Want local custom IDX pages with content to brand you the local professional to Google and your visitors? No problem. 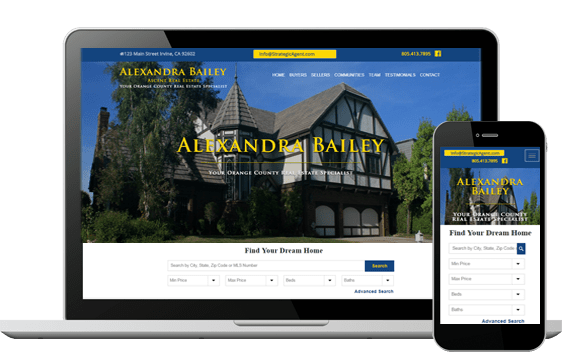 We can also create a one-off color palette and custom homepage widgets for you as well to make your semi-custom Pro Agent real estate website just what you always wanted. Customized Pledge and your Photo. Testimonials on homepage and bespoke page. Quick Loan Quote sent to Lender and You.